Hi Steph H -- yep, that's the Petal Flora alright. It actually would work either way -- the pieces are reversible. I fixed above. Have fun! Thanks. Hi elm -- so glad your crib bumpers were a success! We are just getting ready to roll into some site updates and will be addressing how we want to handle the great photos we've been seeing from visitors. So far, folks have mostly been emailing us their photos via our contact form and we post them as we have time (but we often run out of that!!). So, we are thinking about adding a Flickr option or another photo sharing option. We'll post about it as soon as it's ready to go and you can be the first to add your photos . Thanks! I have finished my baby bedding...how can i attach pictures to share!? Wow, Laura R. -- so nice of you to share your detailed tips for a continuous bumper. I'm sure folks will love having that option ! typo on step #3) Sew (2) 10.5" x 106" panels like a pillowcase, closed on one side end and leaving about a 12" opening on the BOTTOM of the ***unfinished end***, along with the SIDE of same end for easier insertion of the pads. I had to trim 1" off the top of each bumper foam pad on ONE long end. Turn right-side out. 7) Now, for a clean edge on your open side-end seam, open fabric so that your piping runs horizontally down the middle and then, along edge, fold your fabric 1/4" into pillowcase, press, and sew close to edge. Don't worry about a perfectly measured/straight edge around your piping...we'll do that next! Now, for a clean-tucked edge of piping on your open seam end: put right sides of fabric on that end together. With piping on bottom end (closest to you), sew from 1" above piping down over piping. Do this twice for a double hem. *Leave the rest of this side open for last 2 bumper pads! * Now you'll need to sew up that 12" open seam on the BOTTOM edge of your "pillowcase": So, turn open end inside out, right sides facing and double stitch that 12" opening! 9) Turn fabric back out (wrong sides facing) and you should have only your side seam open, beautifully hemmed..piping, ties and all! Insert last two pads as before...attaching your ties on that same seam. When I reached the end, it was a perfect fit! Now sew/hem your open seam closed and viola! Hope this was helpful! Onto the bumper: 1) I sewed both inside and outside-facing fabrics at 10.5" x 106" with a 1/4" seam (I sewed it twice for durability. Not just to hold up from baby, but also inserting the bumper pads, as they should fit perfectly snug.) I followed this tute including piping and it wasn't hard at all! 2) I sewed my end ties on with a double seam, as well. 3) Sew (2) 10.5" x 106" panels like a pillowcase, closed on one side end and leaving about a 12" opening on the BOTTOM of the finished end, along with the SIDE of same end for easier insertion of the pads. I had to trim 1" off the top of each bumper foam pad on ONE long end. Turn right-side out. 4) I folded the bumper pad around my arm and fed my "pillowcase" around my arm until the pad filled into the end. I then ironed the open edge against bumper pad and pinned as close to pad as I could with a tad bit of room. *Be sure to place a row of pins about 2 inches away from last pin row made as well to keep fabric on the back side from folding while sewing!*. I then attached my zipper foot, needle to the left and sewed in my bumper. 5) Now, sew your two ties for that row in place along seam just sewn by folding ties in half, pressing center and matching to seam. I measured my ties centered at 2" from top and bottom. Double stitch those suckers on! 6) Insert next pad and repeat until you have TWO pads remaining. Hi! I have completed "project bumper" with this wonderful tute...but I managed to make it one solid bumper pad , even using the Nu-Foam (it was perfect!). The piping wasn't even too hard, at all! How'd I do it? I was hoping you'd ask! First I will tell you I'm farely new to sewing...call me a beginner! But after this easy tute, I feel like a pro! I've never typed a tute before, so I apologize in advance if anything is unclear. I hope to attach photos of my completed project soon! Thanks so much for posting this tutorial! You made a mountain of a task seem easy and fun! To make one solid bumper pad, first you'll need to adjust your measurements and quantity of ties. Ties: Cut (5) 31" x 2.5" ties and (I made my lower ties smaller) at (5) 15.5" x 2.5". I followed the tute for the end ties making (2) 15.5" x 2.5" ties and again, my lower ties were smaller at (2) 7.5" x 2.5". I followed the tute for the end ties but for your outside ties: BEFORE sewing, after pressing flat horizontally (right sides facing), fold in half left to right, find center and press edge with your finger. Pin center and also pin 1" to the left and 1" to the right. This will be your opening seam for turning fabric right-side out. After sewing and turning, press tie so that your open seam is tucked in and follows your sewn seam. Sew/hem opening and your tie will be beautifully sewn on both ends! Thanks for the pix -- very nice fabric choices! And, thanks also for letting our friends know about the sheet tutorial ad well as an alternative crib skirt. These bumpers are so cute, I took a neutral spin on the color and pattern but think it turned out just as cute! Hi Marigold, Thanks for the compliments. 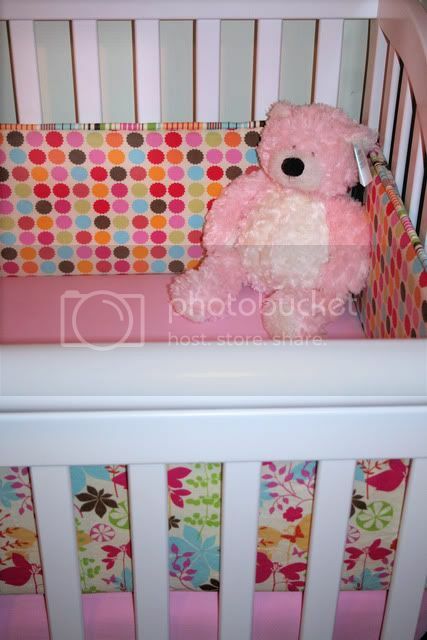 I'm sorry, but this particular shoot was done in the nursery of a friend-of-a-friend-of-a-friend... so I don't know the brand/model of the crib. I love your nursery projects!!! I have a random question....what brand/model is the crib in the photo at the top of the article (not the reader contribution photos, but the photo included in the article)?? I absolutely love it! Thanks!! I have a suggestion to add to this tutorial. What about a crib sheet tutorial? I have very specific colors I like and I'm having a hard time finding the right color I want for a crib sheet that is ready to purchase. So I had the idea to make a crib sheet myself. Hope this helps -- let us know how it all works out. I can only get my hands on 3 yards and 23" of the fabric I love...would I be able to stretch to make this enough for the front and back panels of the bumper? I'm so excited about making these bumpers! I'm ordering my fabric tomorrow. I also love the lanterns as a mobile. Do you know where you got them? They are adorable! Hi Shaina -- thanks for the link to your blog to see your beautiful finished projects. Great fabric choices and I love how you added a little border to the blanket. I'm going to put in your little note about rounding the corners of the foam using the same template you use to round the corners of the fabric. We did that as well... and sometimes assume others would just know that . Thanks again, I'm so glad we could be an inspiration. Thanks also for linking back to Sew4Home for the tutorials. We ALWAYS appreciate folks passing us along to their friends and family. The other link didn't seem to work. Here it is again! Just made the crib bumper pads and I love them!! I've saved this tutorial for a while, until I was ready. My baby is now 8 months old and it was time to get the crib ready for him!! Anyway, I absolutely love these bumper pads. I made a post about it on my blog, with lots of pictures. I also made the ruffle-edge blanket to match! Thanks for both of your tutorials!! hi snowmartin -- I'm so happy you're making our crib bumpers -- and in our fave fabs to boot! I've added a few words in the instructions above that may help clarify this step for you. If you refresh the page, you'll see the new additions. But, in general, yes -- you may need to rip out your stitches and make sure your piping is centered. You are starting at the large dot on one side and going along the top to the large dot on the opposite side. The ties go just below the ends of the stitched piping on each side as shown in the picture. Hope that helps. Hi-thanks so much for sharing your pattern! I am working on my crib bumpers now and have a question... I've stitched my piping to the "petal jester" fabric, starting at the large dot that I made using the template, but I've noticed that the 30" piping is not centered along the fabric. It starts at the large dot on the right side and ends in the middle of the fabric on the left side. Is this correct? Should I rip out the stitches and instead center the piping around the fabric? If this is correct, how should I sew on the left upper tie since the piping covers the small template dot. Thanks so much in advance! 3. This may be my most time-saving tip yet. Regarding the turning 24 ties right-side out: beg, borrow, or steal a Hemostat! I have one that I've used for years to turn little 'fabric tubes,' like the 24 ties required in this pattern, right-side out. You just insert the hemostat inside the tube, gently pinch and lock a piece of the fabric and pull it right-side out! Voila! SOOOO much quicker than pushing that pin through 24 tubes! then I use a pointed chopstick to push out my corners. 4. After I turned the ties right-side out; to make pressing them waaay easier I cut a long strip of cardboard a little narrower than the width of the ties, just narror enough so I can easily insert it-it shapes the fabric in the flattened tie shape, and I iron it w/the cardboard in it. It makes the seams nice and crisp so your ties are perfect. 5. When you are totally through sewing the bumper case; go around and cut the curves on all 4 corners-on the 2 upper curves, just follow the cuts you made in your cording-no need to make additional cuts. But by doing this you will make your bumper case have a lot more 'give' and it will cover the bumper pads more easily. I even put a few cuts in the long straight sides just for a little more give. But remember, be careful not to cut your seam line-just perpendicularly cut up to it. I've been sewing 35+ yrs and just made these adorable bumpers for my 1st grandchild. Here's a few tips that I used making them that might help someone out. 1. To help 'ease' the cording around the corner curve-pin it in starting from the center and go from the center out to each side. Then make little snips w/your scissors in the selvage of the cording going perpendicular to the seam line (don't cut into the stitching!) and this will ease it around the curve and it will lay flat for you when you sew. 2. I also find that when I attach cording like this, it is easier to fasten my sewing pins horizontally (not perpendicular to the seam as you normally would) in the cording with the heads facing me. It makes it easier to pin and it also makes the pins easier to pull out as I sew. Hi mom2four -- you did a BEAUTIFUL job! Thanks for sharing. 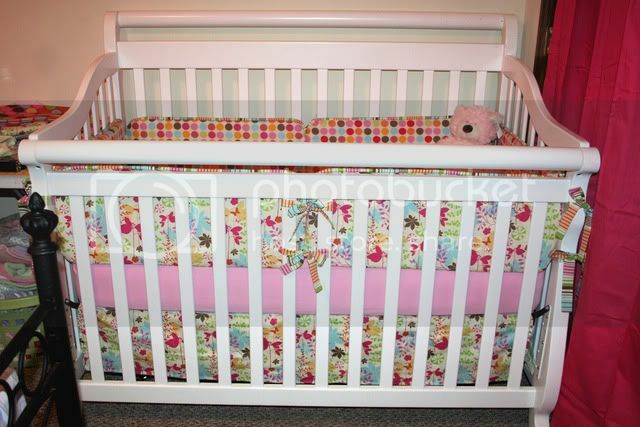 The fabrics you chose are so bright and fun and look lovely against the white crib. Congratulations on your baby girl. Thanks so much for a great tutorial. I am fairly new to sewing and only know the basics but had very little trouble with these. Sewing the piping between the 2 fabric was the most challenging part for me and it wasn't too bad. And I love using the inserts, they are soft without being thick. This is my 4th child (1st daughter) and I will definitely be using the bumpers until she is old enough to sit up or use them to stand on. Thanks so much! I have a comment with regard to the use of crib bumpers. I am a pediatrician in Dallas, Tx and I am expecting my first baby. While it is true that the "experts" have recommended different things over the years, we are now able to make recommendations with many years of data to support these guidelines. The most current recommendations of the American Academy of Pediatrics can be found here: http://aappolicy.aappublicatio.../1245.pdf. This is a long article intended for medical professional. However, if you look towards the end, there is a numbered list of safe sleep recommendations that everyone should be able to understand without wading through the whole "statement." Bumper pads are no longer recommended unless they are the "breathable" kind. I personally have seen many children presenting in the emergency room or admitted to the pediatric intensive care unit because of sleep-related issues, some of whom did not survive. This is most often because the parents left the child to sleep on an un-safe surface, such as propped up on a pillow or in an adult bed with bedding that is unsuitable for an infant. This is, of course, a personal decision for each parent. My though is, the bottom line is to ask yourself - why would I do something that may contribute to the chances of my baby suffocating or dying of SIDS? I will not be using bumper pads until my baby is old enough to move around well on his/her own, perhaps 5 or 6 months of age. Hello Kellie -- If you're using 54" fabric for your bumpers, you can get away with just 1 yard. However, you will need to layout the cuts side by side in three rows of two. Each cut is 27" x 11¾", so you will use every bit of width: 27+27=54. But, if you're careful, it certainly will work with one yard. If you have a strong directional print that won't accommodate a horizontal cut, then you'll need 1½ yards. You'll end up with some chunks of waste with this second option, but could turn those into pillows or blankies. Hope that helps. Have fun! You said you need 2 yard of 45" fabric... how many yards of 54" fabric would you need? Thanks for your question. A one-piece bumper would really be a whole different approach. Our project was designed to utilize the individual pads and allow the most flexibility in sizing with the multiple sections. To do it as one piece, perhaps using a batting product for your fill would be a better solution. You could measure the circumference of your crib and plan your cutting length based on that measurement. To make efficient use of your fabric, you’d need to seam it at some point. The height we used would probably still be fine. There would also a lot of continuous piping with one piece, so you might consider leaving off this trim. We’ll noodle over this question a bit more here with the s4h team, and perhaps add a future bumper project with this one-piece approach. If anyone else has a good one-piece bumper pattern, let us know. Thanks! Hello , I there any way to make this all one piece.? My babies are now adults having babies of their own, I know I was met with different theories and must do or must not do from the so called Experts. Each day new research threw up a new theory. So I took a leaf out of centuries of wisdom as practised by pragmatic mothers of children, I trusted my own instincts. When my first child was born, current wisdom from the experts was wrap the infant and lay it on it side, then tuck the bedding tightly to prevent rolling. Child two it was dont wrap infants, lay them on their tummies, child three and child four, well by then I found it depended on which guru was in fashion as to the advice offered. Having had a baby who insisted on ramming his head tightly against the cot rails, and developed a nasty ridge on his forehead, I devised a cot protector, that was 45 years ago. I'm now going to use this article to make another for my daughter in law. Hi dbdoenias - thank you for your thoughtful comment. Janome is our Signature Sponsor but does not make our editorial decisions. As an Editorial staff, we did discuss the pros and cons of having a crib bumper project. 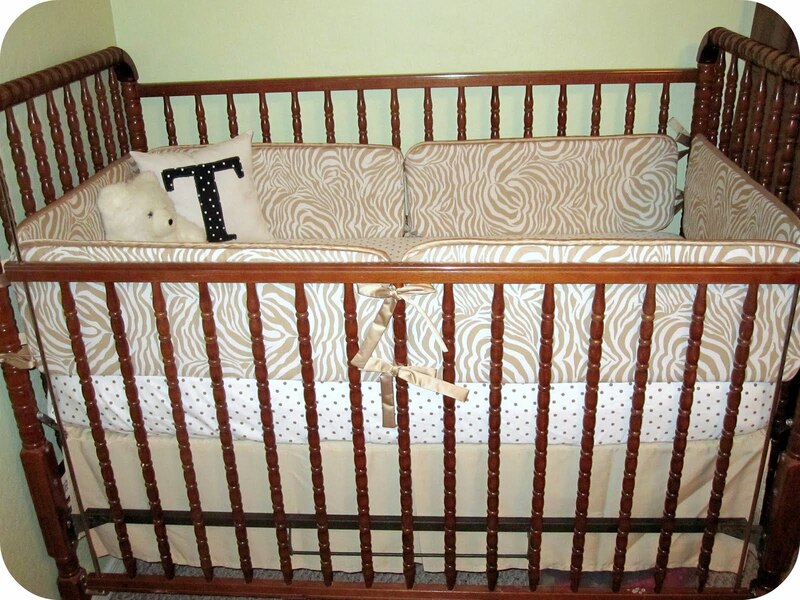 There are some cautions out there regarding bumpers and SIDS, but there were an equal or greater number of concerns about the danger of arms, legs or even heads getting trapped in crib rails, as well as head bangs and bruises. Virtually every place we found that sells baby bedding sells bumpers, so we felt it was an option that should to be included. We made sure our bumpers followed the best-practices guidelines for construction, length and number of tie used to secure the bumpers, and the use of flat and dense padding rather than puffy batting. Thank you again for your comment, and we encourage people to do their own research and/or talk with their pediatrician before deciding if crib bumpers are right for them. The baby experts also say "Do Not Use Crib Bumpers" anymore. I know this flies in the face of everything we're used to in the nursery, however SIDS research continually reveals new information and this is the conventional wisdom being stressed today. It would be wise for Janome to remove these patterns from the website so as to not encourage the creation of items that pediatricians no longer recommend.